This is a window of opportunity for public comment that will help the llama/alpaca industry. Please make the following comment to BLM (verbatim is suggested) anytime between now and the close of the open BLM public comment period on June 13th, 2019. While your comment pertains to only one BLM jurisdiction in Alaska, it is important to curtail potential damage to the alpaca/llama industry in all 50 states. BLM’s identification of llamas and alpacas as a health risk to wild sheep is unscientifically founded and invites public prejudice against alpacas/llamas. BLM’s position on this issue is not shared by the Alaska Department of Fish and Game who manages the wildlife resources in this BLM jurisdiction. Your comment will point out to BLM that they are inconsistent with ADF&G. Please help curtail the “domino effect” of inappropriate rule-making in Alaska that could spread to other public land jurisdictions throughout the United States. "I request that BLM remove the word “alpacas” and the word “llamas” from 2.7.5 Wildlife #3 (on page 2-25). Rationale: Alpacas and llamas (camelids) are not “similar species” because they reside in very different taxonomic classifications as compared to goats and sheep. Furthermore, there is no scientific evidence that alpacas and llamas pose a health risk to wild sheep. Per a letter from the Alaska Department of Fish and Game (ADF&G) to the Greater Appalachian Llama and Alpaca Association dated June 11, 2018, ADF&G states “we have no intentions to promote or support limiting the use of South American camelids on public land in the State of Alaska” and ADF&G “has no plans to change or focus our disease surveillance efforts related to camelids.” For more information and to see a copy of the ADF&G letter go to www.packllamas.org"
We recommend that you choose one of the following methods to make your comment. 3) Mail comments to: BLM Anchorage Field Office, Attention—BSWI RMP, 4700 BLM Road, Anchorage, AK 99507. Recently hiked the Lower Eagle River Trail to Barbara Falls. There is still quite a bit of snow and ice on the trail in combination with mud where the trail has thawed. We used ice cleats in some areas where the ice was still hard. 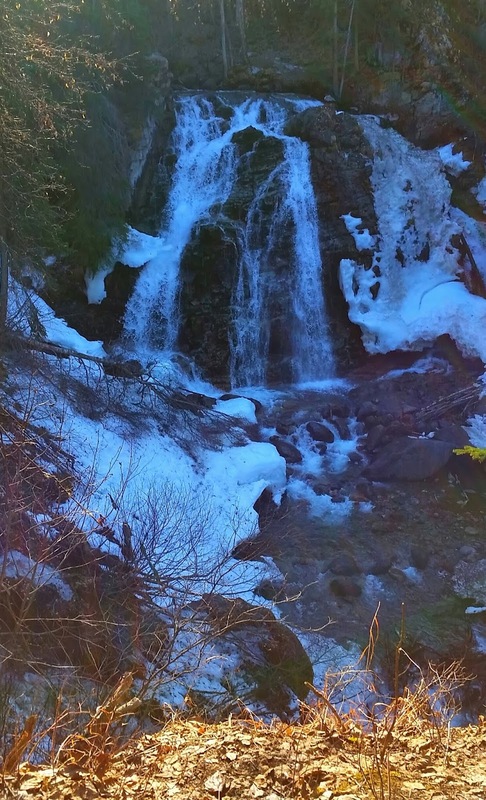 The Southfork is mostly thawed and there is an ice/snow bridge at the tree (below) so you can easily cross the Southfork to continue on to Barbara Falls right now. 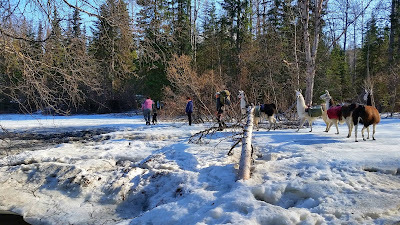 Not sure how long that will last, but the Southfork is low so when the ice/snow bridge melts you may be able to wade the Southfork if you want to continue on the trail to Barbara Falls. Due to the warmer than usual temperatures this spring, I expect trail conditions will change rapidly Be prepared for lots of mud when the ice and snow melt. Crossing the Southfork over the snow bridge at the fallen tree. For more information on this hike, driving directions etc., see an earlier post "Lower Eagle River Trail" on this blog under Alaska Hikes. 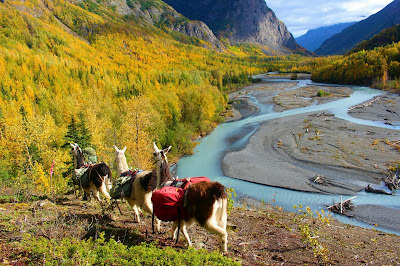 Also see Alaska Llamas on Facebook. Can't carry a heavy backpack into the wilderness anymore? 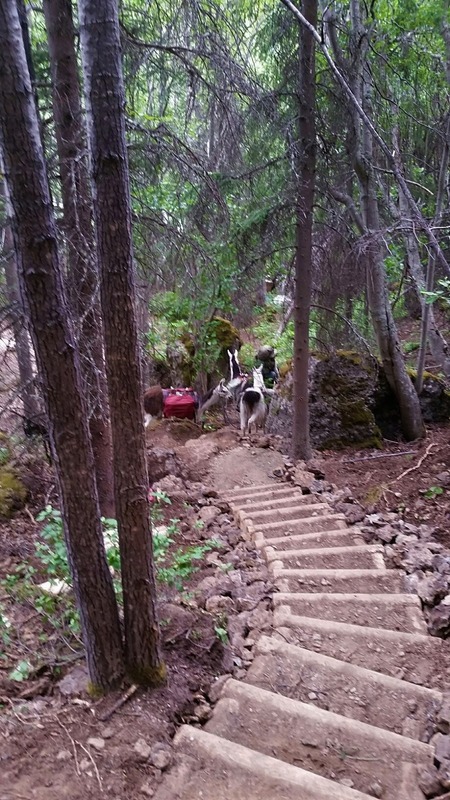 Then let your 300 pound hiking (llama) partner carry the pack and you can still enjoy the wilderness! Checkout the PBS video below for more. Monica Drost and her friends have been backpacking together since they were in college. But now in their 50s, they can’t carry their heavy packs anymore. Luckily, they found a llama outfitter and can now enjoy the wilderness without the aches and pains. The Historic Iditarod (aka Crow Pass) Trail which spans the Girdwood Valley to Eagle River is considered one of the best trails to hike in the Chugach mountain range and offers diverse scenic sights including glaciers, waterfalls, wildlife. It’s not only a great hiking/backpacking route, but it's also an historic portion of the Iditarod Trail that led from Seward to mines in the Interior. A bit of trivia not known by many is that this trail was rebuilt in the 1970s with girl scout labor. There are a number of hiking options from the Eagle River Nature Center (ERNC) parking lot. You can hike the entire twenty-three mile traverse, hike portions of the Crow Pass trail (as I often do) or take other shorter trails that start from the ERNC. Follow this link for more on these shorter trails. Eagle River Nature Center Trails. If you elect to hike the entire twenty-three mile traverse you can start from either Girdwood or the ERNC. The Elevation Gain is 2,100 feet from Crow Creek trailhead; and 3,100 feet from the ERNC so most hikers start from the ERNC. One of my favorite sections is the trail from the ERNC to Heritage Falls. It's about a 10.5 mile round trip (RT) from the ERNC and makes for a nice day hike. The trail from the Nature Center to the Perch (mile 4) and then on to Heritage Falls (mile 5) can usually be hiked all times of the year including winter. From the ERNC, the first section of trail meanders through the woods until it meets up with the Eagle River at Echo Bend (mile 3) where it generally follows the river from this point forward. At about mile 1.2 the hiker gets a first glimpse of the Eagle River below the "Rapids Camp." (There is a short trail down to the river opposite the Rapids Camp.) It's not uncommon to see moose, sheep, goats and bear on your way to Heritage Falls depending on the time of year you are hiking. During the fall, you have the added bonus of stunning fall colors. The trail once ran adjacent to the river at approximately mile 4 near the Perch. Due to erosion it has been rerouted above the "Perch" and outstanding views of the Eagle River can now be had from the new "high" trail. During winter months when the river is frozen, the hiker can alternate between the river and the trail. The trail from the Perch to Heritage Falls is more direct than following the river on this section. So I usually hike the river from Echo Bend (when frozen) to the Perch, and then get back on the trail just beyond the Perch for the remainder of the hike to Heritage Falls. Once you've hiked about five miles (from the ERNC), you will notice some camping spots near the river. At this point, look across the Eagle River, and you will see Heritage Falls - frozen in the winter. This is a great place for a lunch break (or an overnight if you are camping). If you hike another half mile, you will arrive at Icicle Creek. Whatever your destination, enjoy!